I read that story in the 80s, although it might be older. It starts with a young genius who becomes a rock star. He's out practicing in a field, singing to a flower, when he realizes that he's sensitive enough to hear the flowers' vibrational reaction. Next, a major city in the USA and one in the USSR are threatened with annihilation if the super powers don't disarm their nuclear and psychic weapons. A major and a woman are consciously elevated when they find the singer's body in a coma at a (pre?) cryo facility. 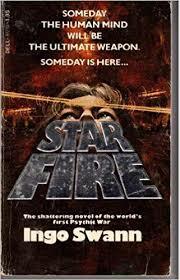 Star Fire by Ingo Swann. It had happened in a country meadow while he was at work on composing a new song. The words resisted for a while, then fell into place. And with their ordering had come the music. He was pleased and sang it, tentatively, to a flower nearby, a small one with three delicate, pointed creamy petals. When he finished singing it, there was an echo. At least so he had thought. But it persisted and did not die away. Reverberations in his guitar strings? But they had quieted. It was the flower trembling, singing back to him. And then he understood that whatever else that special awareness might be, it had ears beyond ears and eyes beyond eyes. That had been several years ago, but the delicate sound lingered in his mental corridors. He had been curious enough to look the plant's name up in a wild-flower guide: trillium. Not the answer you're looking for? Browse other questions tagged story-identification psychic evolution or ask your own question.